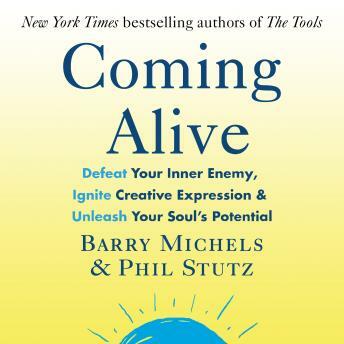 Random House presents the audiobook edition of Coming Alive: 4 Tools to Defeat Your Inner Enemy, Ignite Creative Expression and Unleash Your Soul's Potential, written and read by Phil Stutz and Barry Michels. This edition includes a bonus PDF of graphs and diagrams. From the international bestselling authors of THE TOOLS and GOOP's resident psychotherapists comes a ground-breaking new book to help us overcome the side of us that is destructive and negative to find a deep level of happiness and fulfilment. Just as we are all motivated and driven by a positive desire to be our best, live by our values and to follow our dreams, so too are we all held back by a negative, destructive and fear-driven side of ourselves. It is this part of us that compromises our ability to realise our potential and be truly happy - the side of us that the authors called our Part X. COMING ALIVE is an inspiring, practical book to help us wake up to how we are being held back in life and to energise us to finally achieve our full potential.